A train carrying the Duke and Duchess of Windsor stopped in Flaxton in the late 1940's. All school children went to the area by the hotel and station. Roxy McCarthy gave them a bouquet of flowers. Does anyone else remember? Some time in 1903 a little old man and a large dog came to Flaxton. The old fellow pitched a canvas tent about where Bennie Holte's house now stands. He lived in the tent two summers and two winters, and earned a meager livelihood by doing odd jobs around town and working on farms. No one ever saw the inside of the old gent's tent, for his dog who was friendly when with his master, allowed no one near his tent when his master was away. Folks wondered how the old man could sleep in the tent during the cold winter months as he had no stove. He never told but it was generally believed that he and the dog slept in the same bed and the dog gave off enough heat to keep his master warm. The old man and his large dog slipped out of Flaxton as quietly as they had entered, leaving the six foot by eight foot tent standing. July 1st 1903, an Automobile appeared on Flaxton streets, it was the first one to appear, but many others showed up in a short time. July 28 1903, an abandoned baby was found on the streets of Flaxton. On April 14, 1913 a delegation of Flaxton citizens met with the village board and demanded that something be done about autos speeding on the streets. One irate citizen testified that it was common practice for motorists to race up & down main street at speeds reaching as high as twenty five miles per hour. Also, the city council ordered the removal of hitching posts from the main street of Flaxton. 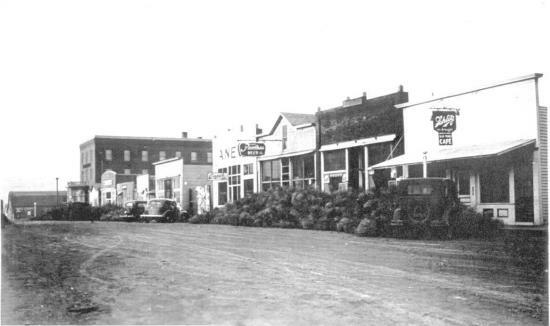 July 1922 - Flaxton celebrated the 25th anniversary of the founding of the Village of Postville. W. H. "Dad" Post attended the celebration, He retold of how he built his first Claim Shack. Nails taken from dry goods boxes were used, and a stone was used for a hammer. Although "Dad" was getting well along in years, he proved that he was agile as ever by smoking a cigar while standing on his head. March 1934 - W. H. "Dad" Post died at the age of Eighty Seven. He moved to his Homestead northwest of the present site of Flaxton in 1897. He was the Postville Postmaster. 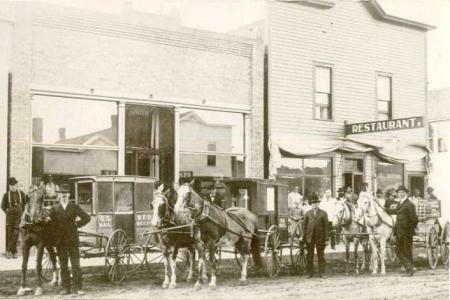 Flaxton's Birthday - Main Street in 1902. The Soo Line Depot was was built in 1902. 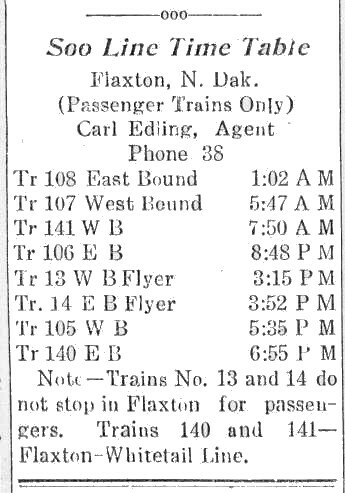 The first Soo Line Agent in Flaxton was A. M. Kerstin, he was later succeeded by John S. Bradish. The First Passenger Trains were # 3 Westbound & # 4 Eastbound. Later they were changed to # 13 Westbound & # 14 Eastbound. There were also at least 2 Freight Trains per day, plus there would be a "special" run at differant times too. During the Summer there was also an extra train run, called the "Dinky" Consisting of an Engine & two Passenger Cars. In 1905 surveying crews were surveying railroad right-of-way to extend West from Flaxton. In 1906 the Branch Line was started which would extend out to White Tail, Montana. The "Branch" as it was called would "Dead Head" out of Flaxton for many years. Many Carloads of cattle were shipped into the Stock Yards in Flaxton from Montana & later shipped on East. The Stock Yards were also used by many "Hobo's" or "Bums" during the summer months. 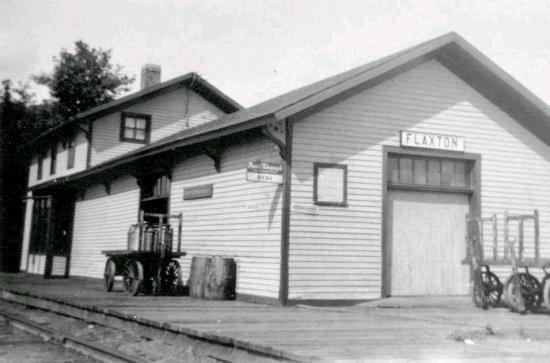 The Depot is now located north of Flaxton on the Norman Nygaard Farm. 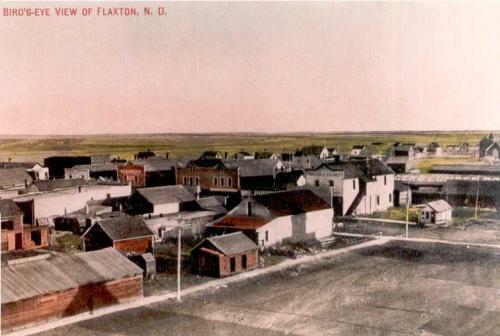 Birdseye view of Flaxton in 1905. 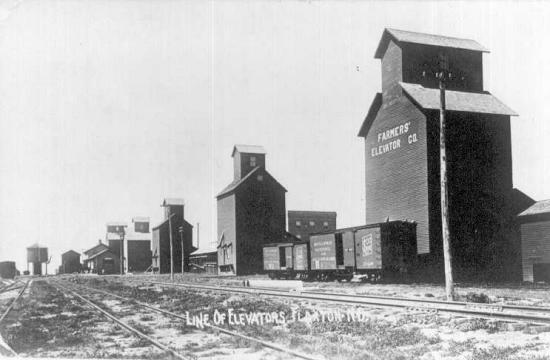 Elevators in a row, 1910. 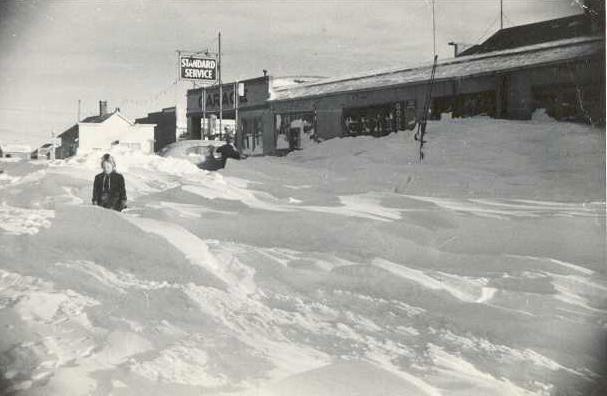 This is a picture of the Main Street of Flaxton in 1937. Those are tumbleweeds that are piled up on the main street. Many scenes like this were common through-out the state during the "Dirty Thirties". The Seibert Hotel was built in 1909. 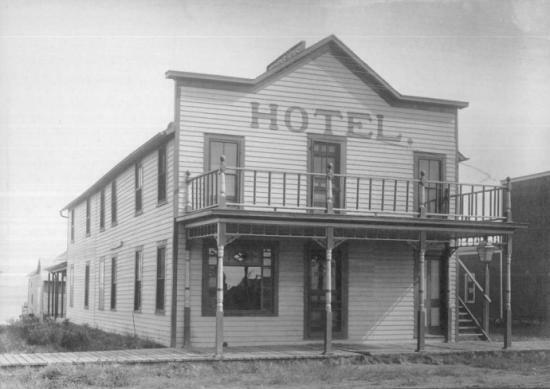 During Mr. Seibert's management, the hotel was known by traveling salesmen as a very good place to stop. United States President Taft, traveling through North Dakota, stayed overnight in the hotel & Seibert prepared a chicken dinner for him. Seibert invited all the town dignitaries to dine with the President of the United States. Mr. Seibert sold the Hotel to Leo F. Mohlzon in 1946. It was renamed the Flaxton Hotel and remained so until it was demolished in April of 1987. 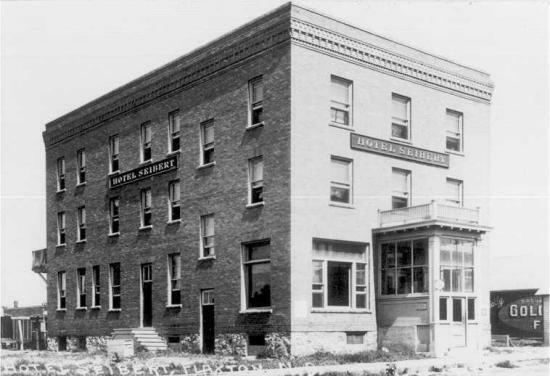 Some of the bricks used in the construction of the hotel came from the brick plant south of Kenmare ND. President Taft traveled with only his secretary & without any body guards. (Now known as the Secret Service) President Taft was in office from 1909 to 1913. 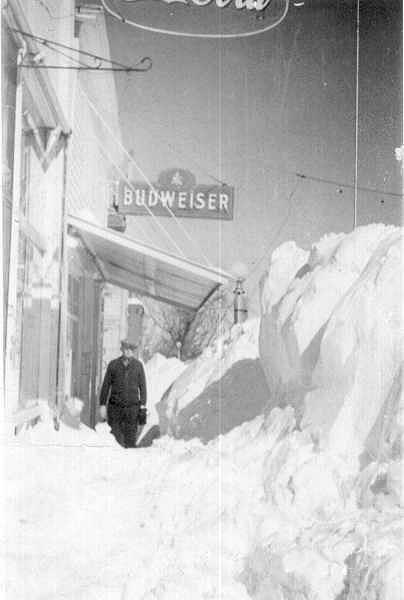 Winter 1943 Winter the way it used to be. 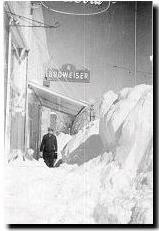 The Winters have been getting Milder than they were back in the 40's & 50's. The Winter of "48" and "49" was also bad, Hay had to be flown in & dropped to feed Cattle, & Also the mail had to be dropped by Airplane.